Per usual, click the names above to go to their profile. Lots of exciting stuff, let’s get to it. We kick off the card with two rookie matches, they have so many new wrestlers now that it can’t be contained in one match. 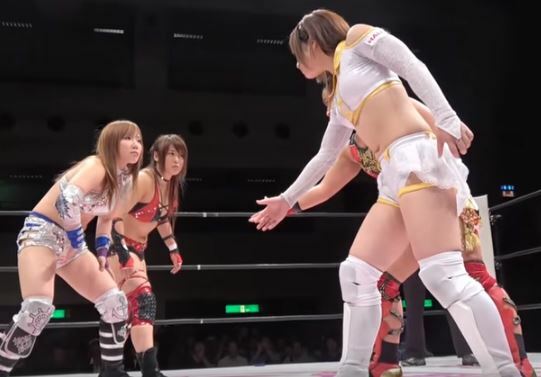 Alex Lee is the veteran here leading the youngsters, as she teams with the 13 year old Azumi against Actress girl’Z wrestlers Nishina and Natsumi. Lee is in Azumi’s Army so is technically the follower to the leader Azumi, which naturally isn’t taken too seriously as it is a lighthearted faction. Azumi and Natsumi (aka Grandma according to Azumi since she is ‘old’) start the match, but they reach a quick stalemate and tag out. Nishina is tossed to the mat by Lee but Nishina hits a quick drop toehold followed by a face crusher. Natsumi comes in and they both dropkick Lee, Natsumi puts Lee in a stretch hold before stomping her repeatedly. She tags Nishina back in but Lee slams Nishina before hitting a high knee in the corner. Another knee by Lee, and she covers Nishina for a two count. Azumi comes in to help work over Nishina, Lee covers Nishina with one foot but Nishina kicks out. Lee tags Azumi, dropkick by Azumi and she puts Nishina in a crab hold. Nishina gets out of it and goes for a Somato, but Azumi ducks it and rolls up Nishina for two. Nishina tags Natsumi, rolling neckbreakers by Natsumi but Azumi wiggles away and stomps on her. DDT by Azumi and she applies a cradle for a quick two count. Lee comes in but she superkicks Azumi by accident. Nishina hits the Somato on Azumi, swinging neckbreaker by Natsumi and she applies a bridge to get the three count! Nishina and Natsumi are the winners. A fun opener, simple but effective. I hope that these rookies stick around for many years to come for how much time I am investing watching them develop, but all three looked good here while Lee was her usual self. A few little rough patches but not as many as one may expect with three inexperienced wrestlers, and it was too short to get dull. A fine way to start the show. Dancing Stars vs. Momo and the newest rookie! This is Nanase’s third match, thanks to Stardom World we are able to chronicle her career every step along the way. Even though all are ‘rookies’ (Momo is in her 2nd year but is only 16 so Stardom still calls her a rookie), Mimura is by far the oldest as she is 29. While Mimura does have seniority, that doesn’t guarantee she will win, however its a safe bet she won’t be pinned by the 14 year old Nanase. 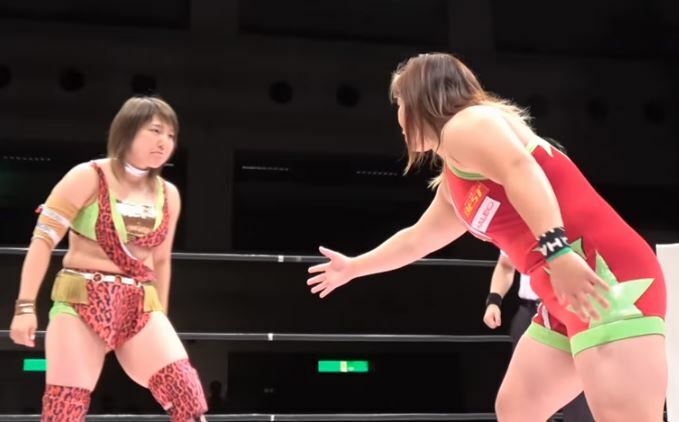 Mimura and Momo start the match at 100 as they run off the ropes back and forth, both hit armdrags until Momo dropkicks Mimura into the corner. Momo tags Arisa, Arisa starts working over Mimura but Mimura gets away and tags in Starlight Kid. Momo is tagged in too, and Starlight Kid drops her with a multiple rotation satellite headscissors but Momo slams her to the mat in return. Momo goes for a Tree of Woe dropkick but Starlight Kid gets out of it, she gets on the second turnbuckle but Arisu grabs her from the apron so she can’t jump off. Momo recovers and throws Starlight Kid back to the mat, kicks by Momo and Arisu kicks Starlight Kid from the ropes again. Satellite sunset flip by Starlight Kid and she makes the hot tag to Hiromi, dropkicks by Hiromi and she hits a diving crossbody for a two count. Starlight Kid and Hiromi both dropkick Mom in the corner, but Arisu runs in and evens the score. Momo hits a vertical suplex on Hiromi, she gets on the second turnbuckle and she hits a missile dropkick. Momo tags Arisu, dropkicks by Arisu and she covers Hiromi for a two count. Hiromi comes back with her rolling leglock, but Momo quickly breaks it up. Arisu picks up Mimura and hits the Blockbuster Suplex, but Hiromi gets a shoulder up. She goes for another one but Hiromi blocks it this time, elbows by Hiromi but the rookie Arisu (I am assuming) gets confused on the next spot and they all look confused for about 15 seconds. Starlight Kid dropkicks Arisu, then Momo dropkicks Starlight Kid, Momo goes to do the Somato but Starlight Kid trips her from the apron. This leaves Hiromi with Arisu, La Magistral by Hiromi and she picks up the three count! The Dancing Stars win! I am not going to eviscerate a bunch of rookies for getting lost in a match, obviously something like that would pretty unforgivable when dealing with veterans but there are no real veterans here so miscues like that are going to happen sometimes. Besides that awkward 15 seconds I thought they did pretty good here, with Starlight Kid being the standout with her smooth rotational moves that keep getting better. She is almost ready for her excursion to Mexico. Nothing to get excited about and a step down execution-wise from the last match, but there is something fun about watching the future stars of a promotion while they are still feeling things out. This is certainly a change of pace and an odd mixture of wrestlers. Not referring to Oedo Tai of course, although even that is a unique team as its all non-natives without Kagetsu or Kimura participating. I mean on the other side, where three Freelancers are thrown together even though they have no ties to each other before this match. Not that it can’t be good of course, but I wouldn’t expect a high level of teamwork from that side as Matsumoto attempts to lead the less experienced (in Stardom) wrestlers to victory. Team Freelancer tries to do a cute pose before the match but thankfully Oedo Tai has none of that and attacks them, leading to a big brawl which the Freelancers get the better of. Chelsea and Shanna dive off the apron onto their opponents, Matsumoto then picks up Wolf in the ring and tosses her out onto her two teammates. Wolf is rolled back in, Matsumoto slams her and covers the feisty creature for two. Chelsea is tagged in but she is tripped from the floor by Vaughan and Atenea. They come in the ring and triple team Chelsea in the ropes, Atenea is tagged in but Chelsea kicks her in the stomach. Chelsea is triple teamed again as Oedo Tai controls the action, but she gets away from Vaughan and hits a leg drop, which gives her time to tag in Matsumoto. Wolf is tagged in too and Oedo Tai handles Matsumoto in the corner, but Matsumoto regains the advantage and hits a missile dropkick on Atenea. Matsumoto tags Shanna, armdrag by Shanna but Atenea armdrags her back before both wrestlers lariat each other. Wolf comes in but Chelsea goes up top and hits a crossbody on both Wolf and Atenea, Vaughan comes in but Matsumoto puts her onto her shoulders, but Wolf bites her leg. They all put each other in submission holds in a unique but ultimately not effective train, they all get out of that and the Freelance team takes control of Oedo Tai. Wolf is isolated, Shanna and Chelsea get on Matsumoto’s back and Matsumoto hits a double kneedrop onto Wolf. Cover by Chelsea, but Vaughan breaks it up. Vaughan boots Matsumoto out of the ring, she get some spray but she sprays her own partner Wolf on accident. Chelsea puts Wolf in a headscissors headlock, and Wolf submits! Chelsea, Matsumoto, and Shanna win! Now we get a rare inter-promotional match in Stardom! We have another one coming in a few minutes. Stardom and Sendai Girls’ have been in an unofficial feud for over a year now, ever since Satomura come into the promotion and won the World of Stardom Championship last summer. This is a very even match-up, as Kyouna and Hashimoto both debuted for their respective promotions last fall and both have a background in sports that encourage strength rather than speed. Win or lose it will be good experience for both as they could become Aces in their respective promotions within the next few years. Hashimoto grabs Kyouna right as the match starts but Kyouna gets away from her, Kyouna gets out of the ring to re-group but returns after a moment with extra fire. They struggle in a tie-up until Hashimoto gets Kyouna in the ropes, and she gives her fellow rookie a clean break. Hashimoto rolls Kyouna on the mat, wristlock by Hashimoto and she continues working over the Stardom wrestler. Kyouna finally fights back and hits mounted elbows, she puts Hashimoto in a crab hold but she crawls to the ropes to force a break. Hashimoto tosses Kyouna to the mat and goes for a cross armbreaker, but Kyouna blocks it and they return to their feet to trade elbows. Shoulderblocks by Hashimoto in the corner and she hits an elbow followed by a couple hip attacks for a two count cover. Another hip attack by Hashimoto but Kyouna avoids her charge and hits a body avalanche in the corner, face crusher by Kyouna and she covers Hashimoto for two. They take turns trying to knock each other over, a battle that Hashimoto wins, but Kyouna gets her to the mat and hits a diving body press off the second turnbuckle. Crab hold by Kyouna, but Hashimoto gets into the ropes. Kyouna tries to slam Hashimoto but Hashimoto blocks it, Kyouna goes off the ropes but Hashimoto slaps her in the face and hits a judo throw. Cross armbreaker by Hashimoto, but Kyouna wiggles to the ropes and gets there to force a break. Back up they exchange strikes, body avalanche by Hashimoto but Kyouna levels her with a lariat. Kyouna forces up Hashimoto and elbows her repeatedly before back bodydropping her to the mat. Kyouna goes up top but Hashimoto gets her knees up when Kyouna goes for the diving body press. Hashimoto tries to pick up Kyouna, Kyouna blocks it the first time but Hashimoto then gets her up and hits a Waterwheel Drop for a nearfall. Hashimoto picks up Kyouna, she hits the Waterwheel Drop with a bridge this time, and she picks up the three count! Hashimoto wins! This match is for the High Speed Championship. Kagetsu joined Oedo Tai in April and has been on a hot streak since then, getting the win in a bunch of tag matches in the meantime. In fact Oedo Tai in general has had a resurgence the last few months, with Kagetsu joining and more outsiders like Atenea hanging around. Mayu Iwatani has held the title since October 11th, and this is her 7th defense of the title. Mayu also holds the Goddesses of Stardom Championship and the Artist of Stardom Championship, so to say she will be easy to put down is an understatement. Kagetsu doesn’t cheat right off the start, which shows some respect for the fact they are in a title match, and the two quickly trade armdrags before reaching a stalemate. Iwatani goes for her split-legged armdrag but Kagetsu blocks it, and Iwatani rolls out of the ring to ponder what to do next. She tries to return to the ring but Kagetsu knocks her back out and this time goes out with her to attack Iwatani around the floor. Kagetsu gets a chair and hits Iwatani in the head with it, she throws her into the ring post and hits Iwatani with the chair again. The rest of Oedo Tai attacks Iwatani before they return to the ring (Oedo Tai comes in too) and they all hit running strikes in the corner. Swandive missile dropkick by Kagetsu, she sets up a chair in the ring and dropkicks it into Iwatani’s head. Iwatani tries to hit a missile dropkick as a comeback move but Kagetsu sidesteps it, Kagetsu puts Iwatani in the ropes and all of Oedo Tai return again as Iwatani is heavily outnumbered. Iwatani finally hits an offensive move and she hits a spinning headscissors, dropkick by Iwatani while Kagetsu is against the ropes, Kagetsu falls out of the ring but Iwatani dives out onto her with a plancha suicida. Back in the ring, bridging suplex by Iwatani but it gets two. Iwatani goes off the ropes but Kagetsu catches her with a pop-up Samoan Drop, Iwatani returns to her feet and the foes trade elbows. Big dropkick by Kagetsu and she hits a high kick, but Iwatani retorts with a high kick of her own. Kagetsu charges Iwatani but Iwatani hits a hip toss followed by a quick footstomp off the second turnbuckle. Iwatani goes all the way up this time but Kagetsu joins her and hits a superplex. Iwatani charges Kagetsu but Kagetsu hits a cross armbreaker takedown, but Iwatani gets to the ropes. Vertical suplex by Kagetsu and she hits the Ebisu Drop, but Iwatani barely gets a shoulder up. High kick by Kagetsu but Iwatani blocks the Yoshi Tonic. Quick roll-ups by Iwatani for two, she goes for a crucifix hold but that gets a two count as well. Kagetsu gets her Parking Sign but Iwatani ducks the blow and she hits Kris Wolf by accident. Hurricanrana by Iwatani, she gets the sign and she puts it onto Kagetsu’s chest before hitting a diving footstomp off the second turnbuckle. Superkicks by Iwatani, she picks up Kagetsu and she nails the enhanced Dragon Suplex Hold for the three count! Iwatani wins the match and retains the High Speed Championship. No titles on the line here, just a grudge match between old foes. The feud between Stardom and Sendai Girls’ started passively when Satomura started wrestling in Stardom last spring, but reached its peak last fall when for the first time other wrestlers in both promotions got involved as well. While its not a full time war, whenever Stardom does have inter-promotional matches, Sendai Girls’ is their preferred partner. This one has a lot of backstory, as Hojo and Satomura battled for the World of Stardom Championship, as did Satomura and Shirai. On top of that, Hojo and Iwata had a singles match last fall so they don’t like each other. Expect this one to be heated. Iwata and Hojo begin the match and Iwata immediately hammers in the elbows, but Hojo has none of it and returns fire. Big hammer fist by Hojo to get Iwata down, Hojo works over the rookie with holds but Iwata dropkicks her to the mat and tags Satomura. Satomura knees Hojo against the ropes before rolling her to the mat and putting Hojo in a headlock. Satomura tags Iwata back in, PK by Iwata and she covers Hojo for two. Iwata tags Satomura as Hojo is officially the Face in Peril, she goes for her spear but Satomura blocks it and hits a bodyslam. Shirai comes in to help but Satomura slams Shirai onto Hojo for her trouble before throwing Shirai out of the ring. I just love sequences like that, one of my favorites. Satomura tags Iwata but Hojo levels her with a spear and tags in Shirai. Shirai goes up top and comes in the ring with a missile dropkick, she kicks Iwata out of the ring as Satomura come in, and Shirai back bodydrops Satomura to the floor. Shirai then gets on the second turnbuckle and hits a moonsault down to the floor onto both the Sendai Girls’ wrestlers. Back in, cocky Ace Shirai takes over on Iwata before tagging Hojo back in. 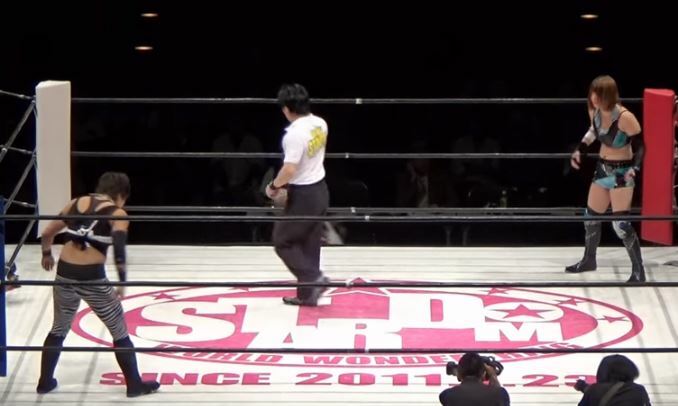 Hojo tosses Iwata by her hair before Shirai returns, and Shirai does her patented hand walk kneedrop. 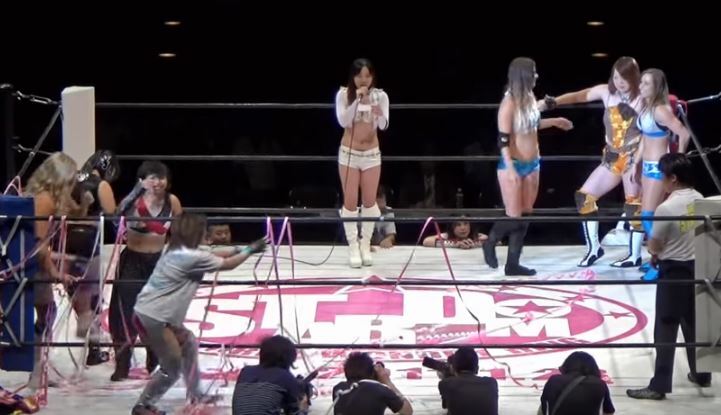 Shirai methodically attacks Iwata, Iwata slides away but Shirai stops her from making a tag. Superkick by Iwata and now she makes the tag, rebound elbow by Satomura to Shirai and she knocks Hojo off the apron just for good measure. Shirai and Satomura engage in a strike battle until Satomura slams Shirai to the mat and covers her for two. Shirai comes back with the cartwheel dropkick, she goes off the ropes and dropkicks Satomura in the head. Shirai tags Hojo, chops by Hojo but Satomura kicks her in return. Irish whip by Satomura to the corner but Hojo hits the triple jump rebound elbow, Sliding D by Hojo and she covers Satomura for two. Submission hold by Hojo but Satomura gets out of it and hits a backdrop suplex. Kicks by Satomura, Shirai tries to help with a swandive move but Satomura smacks her before she can jump. Cartwheel into a kneedrop by Satomura to Hojo, she goes up top but Hojo hits a palm strike and throws Satomura into the mat. Pele Kick by Satomura but Hojo fights back with elbows before hitting a backfist. Kick to the head by Satomura and both wrestlers crawl to their own corners to tag out. Iwata kicks Shirai in the chest, high kick by Iwata and she hits a suplex for a two count. Enzuigiri by Iwata, Satomura comes in and she drops Shirai with a backdrop suplex. Iwata goes off the ropes but she dropkicks Satomura by accident, Shirai puts Satomura on her shoulders while Hojo goes up top and Hojo hits a jumping elbow smash. Shirai grabs Iwata and hits a double underhook facebuster, but she lifts Iwata before the three count to taunt Satomura. Satomura comes in but so does Hojo, and Satomura kills Hojo with a high kick. Pele Kick by Satomura to Shirai, and Iwata rolls up Shirai for a two count. Iwata goes for a bodyscissors but Shirai catches her and hits a German suplex. Shirai hits a dragon screw on Satomura, Iwata slaps Shirai and Irish whips her but Shirai sails out of the ring with a plancha suicida onto Satomura. Hojo comes in the ring and hits a diving elbow drop onto Iwata, Shirai returns and nails a moonsault for the three count! Io Shirai and Kairi Hojo are the winners! While Stardom cards have fallen into the same match pattern for the last few months (rookie match-rookie match-random freelancer match-Oedo Tai-match-Big Match Io), this was a nice change of pace with Sendai Girls’ participating. The Kyouna/Hashimoto match may be the best singles match between two legit rookies I have ever seen, and the main event was fire. Kagetsu/Iwatani didn’t reach the level it could have but was still a really fun match as well, so the top three matches on the card are worth watching for sure. The undercard was generally inoffensive and not a bad watch either, although it can be skipped if you are in a time crunch. Overall one of the better Stardom cards in awhile, head over to Stardom World and check it out.